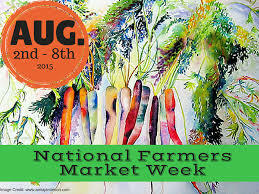 It is National Farmers Market week ! Join us tomorrow, Saturday, Aug. 8th, as we celebrate being part of one of the best Farmers Markets in the U. S.
Mitch Armstrong Nursery is proud to be one of the original core vendors of the Saturday Morning Market St. Pete, since it's inception 13 years ago ! Being full-time vendors at the market is our full-time job and we are grateful for the support of our community that gives us a place to make a living and enables us to continue to give back to our community also. We are full supporters of the "Buying Local, Saves Locals" ! Join us at the Saturday Morning SUMMER Market at Williams Park tomorrow as we celebrate and continue to bring excellent and exciting plants to the market day. SUMMER MARKET RUNS THROUGH TO THE END OF AUGUST - ONLY 4 MORE WEEKS ! The new regular season at Al Lang Field will begin Sat. October 3rd. Remember, Expect the Unexpected from Armstrong Nursery - Thank you for your support !